You want to create a tree system where an NPC can move around to chase a player. So this tutorial is about trying to understand tree search with Breadth-First-Search (BFS) and Depth-FirstSearch (DFS). The picture shows a tree, often you will see them with the A node on top but whatever the orientation of the tree mine goes rightward. A tree is made of generations, on the picture, A is first generation, B and C are second and so on. 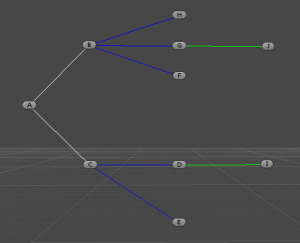 The target node may be any node, including the start node or no node on the tree. Tree could be more complex like having multiple parents and looping but we will not consider them in here. Just the simple one that can get you going right away. So I mentioned those earlier and simply they are algorithms. They pretty much do the same thing but in a different way, ok that sounds wrong but hear me now. Consider we are looking for a path between A and I, there is two ways we can consider the search, first we obviously start from A. Then we go down one generation and find B and C. This is when we decide if we should take care of B and then C or should we take care of B and go down the branch and once we are done with all related to B, then we do the same with C. Let me clarify that. Let’s take a first case, we have A, is it the target node? Nope, so we find B and C as children, we store them in a collection. Now we take B out of the collection, is it the target node? Nope, so we find FGH as children and we store them in the collection. Now what do we do, are we going down the branch with F or are we finishing the generation taking care of C? This is all the main difference between Breadth-First-Search and Depth-First-Search (as for implementation), if we do generation by generation we use BFS because we working in breadth of the tree, if we go down the branches we are using DFS because…because we go in depth first for our search. But which one to choose? Which one is best? I leave the deep research to you and your friend google, this field is way too broad to be covered in one article. The main difference is that BFS will return the shortest path by generation while DFS will return a path which will be the first found. I insist on the fact the shortest path found is only valid generation wise. BFS or DFS are not returning the shortest path based on weight, this would Dijkstra’ algorithm. There are other more advanced differences like the fact that DFS is more memory efficient but we just draw the big lines for now. Depending on the target, one will find the path faster than the other but when dealing with algorithm, we do not consider case by case but more likely a generic vision of it or even most likely the worst case. The notation used is the big O notation and in our case we have O(n) which means in the worst case we have to consider n iteration where n is the amount of element in the tree. Worst case being our target is the last node to be taken care. The best case would be 1 where start is target. This is because those algorithms are considered Brute-Force, which means they try until they find just like when you try to remember your password until you hit the right one. This is what makes the difference with A* which uses Heuristic to consider and discard some paths. What is the good point of those then? If a path exists, they will find it. This is applicable if the tree is finite, that is it does not have recursive nodes and it is made sure the tree has a final generation. If the tree can endlessly be extended then it is required to set a maximum amount of iteration or the search will end up with memory shortage. This is logical since the algorithm would keep on adding data without removing. In our case, the real advantage is that we control the paths since we are defining the connections manually. Again, this article only focus on simple tree that are finite, no repetition, no recursion either, just a simple tree. So we saw in the previous paragraph that both algorithms are pretty similar and mainly it is about container. What makes them so different? Well, it is their principle of functioning. A queue is known as FIFO (First-In-First-Out), just like when you go queuing at the shop, the first who came in is the first who gets served, when one comes in, he joins at the end of the queue and wait for his turn to come once anyone who came before is done. Queue are often used in networking, where data are flooding in, they are all enqueued on a buffer waiting in line to be treated in order. If you pop out a data, it can only be C. Should you be looking for A, you first need to pop C and then B and finally you get A. Since DFS and BFS are pretty similar in implementation, I will only focus on BFS and also because it minimizes the recursion issue. Now we need to populate that via the inspector. We first create a bunch of empty game objects and add the script. Then we start making the connections. I would recommend to place them in a tree like shape to ease the use. Also give them name like A-B-C where A is the top node and B-C the second generation and so on. 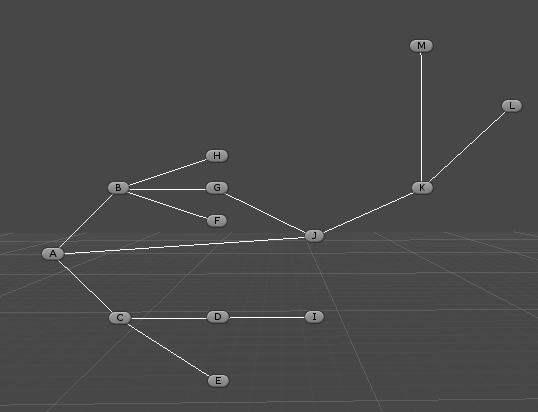 Then simply start the drag and drop process of nodes into each other. You can use the picture at the beginning of the article for model (If you are a little familiar with what we are doing, you are probably getting nervous and ready to drop a complain comment, please read until the end before doing so). This is nothing more than putting code on the algorithm. You can test it creating empty game objects, add the Node script and start creating relation, make sure for the time being to avoid using twice the same node as parent and later on as child or you will see Unity starting and never ending the search. And that will print your valid path. But hold on what if we need to go from H to A for instance or from any node to any other? As it is this is only valid for starting from A, yes it is. 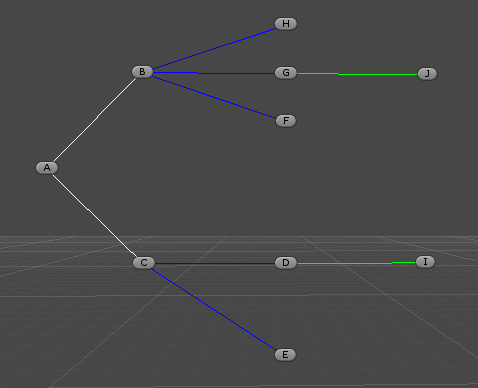 While describing a tree, I mentioned the branches can only be one way while processing. This is true while we are processing the path but this is not when we are defining the possible paths. We will change a couple of things, first off, we do not need the parent anymore because they will change all the time. So we will set them in the code as we go. Second, all nodes needs to also be connected to what was their parent and this one becomes a children as well. So looking at our tree A has B and C as children but B has A-D-E as children, A is added. This will allow us to go both directions. 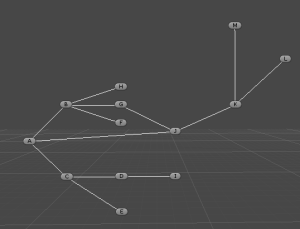 So the longest part is to assign all possible paths up and down. And this is it, you can now find path from any node to any other node. So remember we needed to avoid using the same node twice in our tree but what if we do? So all we need is prevent the recursion simply by avoiding to use twice the same node. I call the new variable used but you may see it as ‘visited’. We just add that variable but we need to set it to false for all nodes in the first place or this is only valid for one round. So we need to keep a list of all nodes and set them all to false when triggering the method. You will notice that even though you are setting the system to be wrong, it may not affect the result, you could just notice that some repetition are happening. Our tree is small, so by the time the recursion is repeating itself the target is found. Consider if the target is 100 nodes down and the recursion happens early, you may create an endless loop. // static array, could also be non static. And this is it for our basic BFS implementation. 6 – Where and how to use it? So we have it all working but you would like an example you can copy paste and use (and then jump to UA because it does not work and you don’t know why since you just looked but not read the article…I know). So the idea here is that we have a player, I will make him really simple and a chaser. But this chaser can only use the node of a tree. The whole point is the event (you can use GetComponent if you wish or you can read this article). Then it is just about checking if the player has moved and call the event incase of. For the NPC, it is a little more complex (just a little). First we need to listen to the event for any player movement, then we get the path between the NPC and the player, we move there and finally we need to check for distance to know if we reach the target. Let’s look at the methods, the Start just finds the player, gets the first path and subscribe to the event from the player class. Update is asking a little more, first if we have reached the end of the path or the player we move towards the player. If close enough, we attack (with a printing, yep not so scary). If we are still on the way, we get the direction to the next node and move there. If we are too close to the node we get the next one. Simple reset the index to 0, get the start node which is the closest node to the NPC and the end node which is the closest node to the player. And then we get our path. I won’t go through GetClosestNode since it does what it says. And this is it. Now you can add a two cubes to your scene, one with the AiScript and the other with the Player script that you name “Player”. Run the game and move the player in the Scene view (or set an input system to move it in the Game View). Try to stay in the tree as we did not define any way to prevent the NPC from leaving the tree. Also, this is all too basic as it moves with Transform, but this was not the point here (the BFS was, wasn’t it?) so I kept it really simple. You may be looking for a project to download butthere is none. The reason is simple, what would you learn if you just download and try and use?? Think for instance of a 2D platformer, you have one NPC that is able to go up and down platform to chase the player, how about placing nodes all over the place, then when the NPC needs to chase you, find the closest node to the NPC and the closest node to the player and run your BFSMethod. The return array will guide your NPC to your player. Obviously, as you are constantly moving it needs to be updated frequently but as I said, this is just a base for you to start with. Hopefully that would guide you down the path of pathfinding. Also, those are heavily used in networking, when a connection between two routers needs to be done for instance. Obviously they use a way more advance version as they need to consider if the router is available, which path is more efficient and so on but the base is here.